Do you want to attract more customers to your business? Or improve your employees’ morale and productivity in the office? One of the best ways to do either (or both at the same time) is to keep your office clean, hygienic, and orderly. By doing so, you show your employees, clients, and customers that you value them and that you’re serious about running a presentable and profitable business. However, keeping everything clean and pristine may prove to be difficult, especially if you’ve got a large office with lots of nooks and crannies to clean. A quality janitorial service can be a great help with that. When you need one in the Arlington, TX area, the clear choice is Valor Janitorial when it comes to quality and efficient service. Valor Janitorial is one of the leading names for professional janitorial services and office cleaning services in the Dallas-Fort Worth Metroplex. We work hard to deliver only the best and highest-quality cleaning services to our commercial clients, using only the most advanced methods and equipment. We’ve also made it a point to use only environmentally safe products in our cleaning jobs, not just to lower our carbon footprint but also to help our clients conform to today’s exacting sanitation standards. With Valor Janitorial Services at your side, you can rest assured that your office or business establishment will always be spotless and pristine. When you need to clean your office or business establishment, be sure to choose a janitorial service that’s known for delivering exceptional results as well as going above and beyond the industry standards when it comes to service and attention to detail. 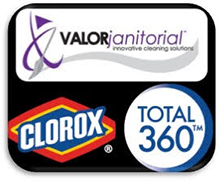 Valor Janitorial Services is that company in the Arlington, TX area. When you need our services, Contact Us online or give us a call at 214-238-9550 to get more information or a free estimate. Very professional and prompt. Great job. Valor helped out my crew on a popular bar renovation show with the cleaning of a very neglected kitchen. They were fantastic and did a GREAT job - I would highly recommend them!!! Valor is easy to do business with and when an issue comes up you are very willing to fix it.